One thing Neil said during NFLUK Inside the Huddle Podcast Tour event was how the NFL are open to change and ideas, that they do listen, so I think we need to take hold of such an opportunity. As fans, we’ve all got a lot we’d like to see improved or changed for the future and so I’d like to propose writing an open letter to NFL UK Managing Director, Alistair Kirkwood about what we’d like to see happen here in the UK when it comes to the game. Having highlight show on at a reasonable times, like when it used to be on a Sunday morning at 10am. 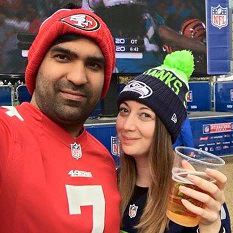 I’d like to see more build up at each of the NFL International Series games as this season there didn’t seem to be much and if there was it was all a last minute announcement if anything at all. I’d also like to see more events like the Inside the Huddle Podcast but for more cities across the UK, I love that us northerners finally got a chance (as generally, everything happens in London!) but so many missed out and I think it’s a real shame as the insight Jeff and Neil bring is incredible and I want more fans to experience that. I’m sure you also have something you’d like to say so write in the comments below or contact me via the ‘contact’ link at the top of the page. Once I’ve had comments from those who contact me, I’ll collate it in to one letter and post it on my blog. If everyone makes an effort to share it, who knows, Alistair might take notice and do what he can on our behalf to address it. Would definately like to see the inside the huddle podcast come to Wales, gutted there wasn’t one nearby. I attended all 3 international series games for the first time, and went to the fan forum with Jim Kelly before the Bills v Jags games, more events like this would be brilliant. Completely agree about the lack of build up on game day, although ohio state band were good, madness not so!!! I like not having to wait the full week to get highlights buy do think there should be some kind of preview show Sunday morning. Hi Liz, one thing that I have emailed Sky about is to get more of the A Football Life programmes shown, not sure if anyone else has seen them but they are fantastic and have really helped me to get into American Football having only started following it in 2013. I see from Wikipedia that there have been approx 10 new versions shown in the States from Oct 2015 to now and from what I can see (as I literally check everyday!) there have only been a couple shown here so far. this may not be an NFL thing and be down to Sky not wanting to show them but seeing the are part of NFL films it thought it worth a mention. Definitely agree about Inside the Huddle coming south too. Living in Bristol we are kind of out the way and the nearest show was Birmingham. Would also love a preview show on a Sunday getting us ready for the games. Absolutely loved the Channel 4 coverage last year for the international series, however it would also be nice to have something similar for stateside games. The fan base here is so eclectic it could be something for everyone. And maybe it could just start with playoffs and wildcard weekend? I think an “X’s & O’s” guide to the game, positions and rules would be great, preferably as a series and preferably hosted by Neil and Jeff. I’ve been watching for 20 years or so and still don’t entirely understand some of the positions and rules! The segments Jeff does in breaks of play are great but I can’t watch both games each week due to time so don’t see them all. A fans guide would help understanding for new fans and old alike. I would find it really helpful if we were given proper advance warning of the pre-game events in London. Really useful for those non-Londoners like me who would benefit from booking rail travel or hotels in advance (and booking time off work if necessary). They must know when these events will be, so why the short notice every time? And agree with the person who said tailgating could be a lot better. Of course having the games back on terrestrial TV would be nice too, but probably out of their control. Needs to be more out of London, weekend/evening events with more publicity locally around them.